Seth is an apprentice Wizard, but he is also one of the “Infected.” Seth was infected by evil creatures called “Nemeses.” Being an “infected one” is what gives Wizards their powers, and having survived the corruption of the Nemeses, Wizards are the only ones who can fight them. Seth is learning how to use magic (called “fantasia”) to fight the Nemeses, but his ultimate goal is to find and destroy their mythical nest, Radiant. As Radiant, Vol. 2 (Chapters 5 to 12) opens, Seth's grueling training under his new teacher, Yaga, continues at the Artemis Institute. Looking for ways to make money, Seth becomes part of a mission to capture Nemeses in the floating burg of “Rumble Town.” Joined by Doc and Mélie, Seth enters the town and makes a shocking discovery about Nemeses. Plus, they meet Grimm, but is he an enemy or a friend... or something else? 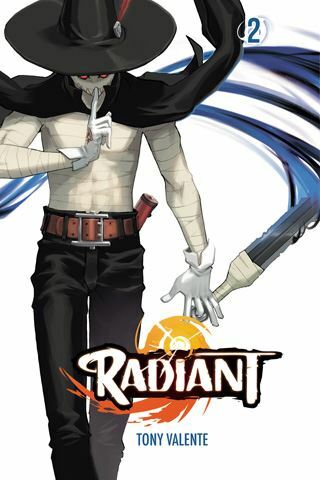 THE LOWDOWN: The Radiant manga was originally a French manga, and it attracted the attention of a Japanese publisher. This offbeat, but detailed graphic novel has broad appeal, which makes it a good American graphic novel. Radiant Graphic Novel Volume 2 reveals more about the series' internal mythology. This volume also introduces a lovely and intriguing new character, Grimm, and I certainly want to see more of this mysterious figure. Seth is remains similar to the plucky and stubborn Uzumaki Naruto, especially the young ninja of the early volumes of Masashi Kishimoto's beloved manga, Naruto. That is another reason to at least take a peak at this interesting new magical-fantasy. I READS YOU RECOMMENDS: Fans of manga about teens with magical powers will want to read Radiant.